BANDALOOP is participating in the Creative Fellowships Initiative in partnership with Department of Dance. BANDALOOP performed at Meany Center on October 5-7, 2018, part of the World Dance Series. Event Details. Artistic director Amelia Rudolph of dance company BANDALOOP, whose work has been described as “bracingly original” by the Oakland Tribune, is developing a new work, Strings with a score by composer Gabriel Prokofiev whose work in merging classical with electronica has been recognized as being “in the vanguard of redefining classical music conventions” by the Financial Times. Through dynamic dance and rigging systems where the rope itself becomes a character, the new harness-based work makes visceral the normally hidden ways we effect and are effected by one another. 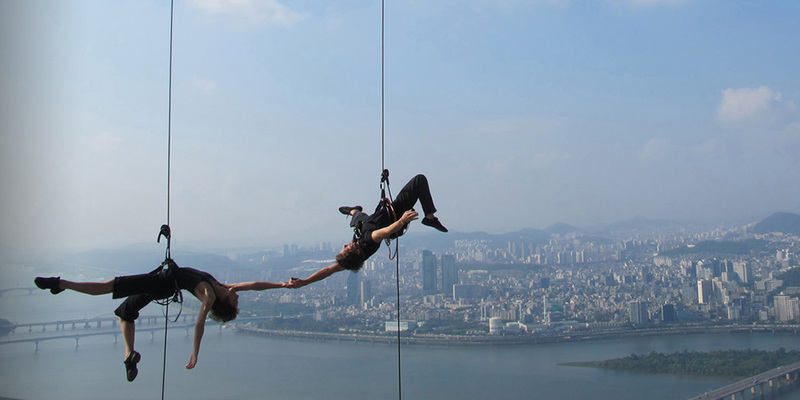 Read a Q&A with Ameila about Strings and BANDALOOP's time in residence.